Although I wasn't lucky enough to be around when people heard Dylan for the first time, I certainly know how they felt. 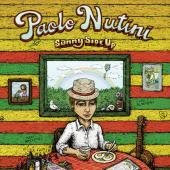 Paolo Nutini a 22 year old Scotsman has truly stunned me. He describes his first album, recorded when he was 18, as naive and full of angst. He wanted to do something 'different' and 'organic' with his next project, and boy did he. I haven't heard anything this different in a long time. To be two discs into your career, and pulling off deep rooted, catchy music like this is truly staggering. You would think that 'Sunny Side Up' was preformed by a band with multiple singers, but this all comes from the same cat. I don't use cat loosely. because sometimes he sounds like a swinging cool cat from the ragtime era, dragging out one verse to the next, while other times his velvet tone reminds me more of Simply Red's Mick Hucknall. The disc's mood and sounds range all over the map from eclectic to Louis Prima improv. Paolo calls it a random mish mash, and although I see his point I better describe it as well planned experimentalism. It really makes me wonder what he can follow this up with. Well, I need to stop over analyzing the craft and just enjoy the music. To give you a taste, he has a song about a conflict with marijuana called 'Coming Up Easy' where he stunningly comes up with an introspective line like 'It was in love that I was created, and in love is how I hope I die.' And in 'Candy' a song about a fight with his girlfriend he modestly laments 'I'm a heartless man at worst, babe, and a helpless one at best.' This is mature stuff for a 22 year old to expose himself so. He writes an ode to his father called 'Simple Things', where he respectfully thanks him for defining the cool confidence of living simply. This may not be for everyone as it is out there and not mainstream, but in uniqueness alone very satisfying. Please give it a listen and tell me what you think. The more I listen to this I can hear Terrance Trent Darby infusions in his voice. He is an acquired taste. I can honestly say I have yet to listen to this album but do like some of his other stuff.